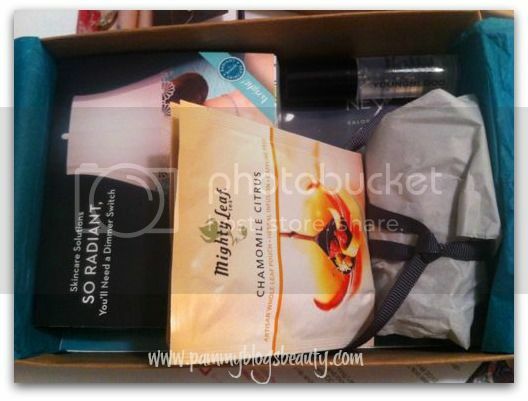 Pammy Blogs Beauty: "The September Issue" Birchbox September 2012: Box Opening!!! 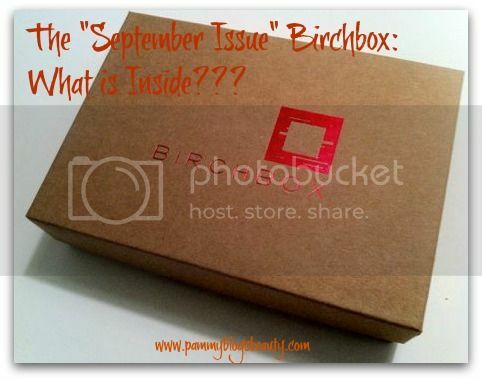 "The September Issue" Birchbox September 2012: Box Opening!!! It is Birchbox Box-Opening time once again folks! As you guys know, I absolutely look forward to the arrival of my monthly Birchbox! For those of you who are not familiar with the service, here is the scoop on the Birchbox monthly beauty sample subscription! Birchbox continues to be one of my very favorite beauty subscriptions!!! The samples (and the $10 price) are really great! 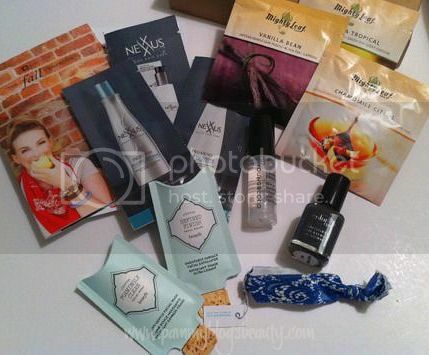 Birchbox is a monthly beauty sample subscription service. For $10 per month, you get a beautifully wrapped box full of 4-5 deluxe size (and the occasional full sized) luxury or boutique beauty products. It is a great way to discover new beauty brands and get out of a makeup/skincare/haircare rut! Plus, it feels as if you are unwrapping a little present! It is my monthly gift to myself and I just love it! I have subscribed for over a year and have just been so happy with the service and the items I have gotten in the boxes. Beyond the boxes being a great value, they are fun! I honestly have found some great new brands and some new favorite products through my Birchbox sample subscription. Curious what has been in some of my previous Birchboxes? 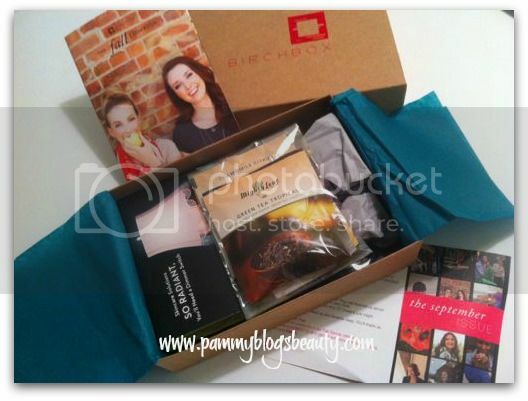 Be sure to check out these posts: Birchbox Introduction Post, Jan 2011 Birchbox, Feb 2011 Birchbox, March 2011 Birchbox, April 2011 Birchbox, May 2011 Birchbox, June 2011 Birchbox, July 2011 Birchbox, August 2011 Birchbox, Sept 2011 Birchbox, Oct 2011 Birchbox, Nov 2011 Birchbox, December 2011 Birchbox, January 2012 Birchbox, February 2012 Birchbox, and the March 2012 Teen Vogue Birchbox, April 2012 Birchbox Box Opening, May 2012 Gossip Girl Birchbox Box opening, June 2012 Birchbox, July 2012 Birchbox, and August 2012 Back to School Birchbox. So what is inside this month's box? Keep reading to find out! BeneFit | Foaming Clean Facial Wash and Refined Finish Facial Polish (paper packets, full sizes $21-$22): While not "deluxe" size (wish they were!) these paper packets seem to hold a bit more than your typical foil packet (but still not enough to really test out the product). Either way, I will be packing these goodies in my travel bag to try during my next weekend trip in a couple weeks. I have never tired BeneFit's skincare, so I am excited to try these out as I really do love the brand. Purify your skin with this glycerin-packed cleanser and natural clay exfoliator. Color Club | Birchbox Custom Polish in Status Update (Full Sized! $8.00, note this full size does look a little smaller than CC's usual polish? ): Whoo-hoo! Ya'll know that I love it when I get nail polish in a beauty sample box. Inclusion of a nail polish almost always seems to make the entire box seem "better", do you know what I mean? This is a deep navy shade that is just perfect for Fall. A color that I will use repeatedly I am sure! I am especially excited since I have never actually tried Color Club's polishes (gasp!). This shade was a collaboration with Birchbox and Color Club and inspired by the Fall 2012 collections. Nexxus | Pro-Mend Split End Treatment System (foil packets, full sizes $9.99-$14.99): Also wish these were deluxe sized because I really want to try this system at length! Oh well, these foil packets will certainly be used on my next weekend trip. I am a fan of Nexxus. So, I am excited to try this new line. Actually, I didn't even know about this line until seeing these samples (exactly why I continue to love Birchbox)! Infused with coconut oil and amino acids, this shampoo, conditioner, and leave-in treatment work together to fix unsightly split ends. twistband | Birchbox Custom Lace Hair Tie (one hair tie, full set of 6-12 $14.00-$22.00): Yay!!!! Another twistband. I have fallen in love with these through sampling them in Birchboxes (and ordering them from Birchbox). My "Mommy Hair" is almost always in a ponytail and these are not only cuter than your usual hair rubber band, but also they seem to be more gentle on your hair. This one is super cute with its lace design. This is going right on my wrist today as I know my hair will end up in a ponytail at some point, lol! Designers went gaga for lace this season and we don't blame them. Get on board with these ouch-free hair ties. Youngblood | Mineral Primer (sample size .17 fl oz, full size $41): Now this is what I am talking about, a nice deluxe sample! I am thrilled with this sample! It is in an awesome pump dispenser too! Can't wait to try this. So perfect for travel. This little bottle will actually last me awhile as I usually apply primer sparingly. I have never tried this brand, but have always wanted to! Thanks Birchbox! Prevent makeup meltdowns with this clear gel primer, which contains skin-soothing vitamins and minerals. Lifestyle Extra: Mighty Leaf Tea Company | tea (3 tea packets, full size set of 6-12 $14-$22): I love, love, love getting tea in my Birchboxes. I am a HUGE tea fanatic. So, I am excited to try these!!! Swap your afternoon latte for these yummy tea blends, made from natural, ethically sourced ingredients. Birchbox Digital Download: Tristan Prettyman: You know, I almost always forget to download these when they come in Birchboxes. This time I am making it a point to try to remember. Overall, I am really pleased with this month's Birchbox! Tons of great items and a deluxe and full sized sample! Many of these items are totally new to me. So, that is always thrilling! Fellow Birchboxers, what did you get this month? Edit: Cute!!! Right after I posted this review, I got an email from the Birchbox team. It is their 2nd Anniversary and they made a cute video saying "thank you" to their subscribers and to bloggers/vloggers. Pammy Blogs Beauty gets a shout-out right around 2:26! So cool! Thanks Birchbox!! !